My question last week regarding content, especially pictures from 20 or more years ago met with a very positive response. So, I will continue to add a selection each week, not too many but ones which I hope readers will find interesting. Please let me know. 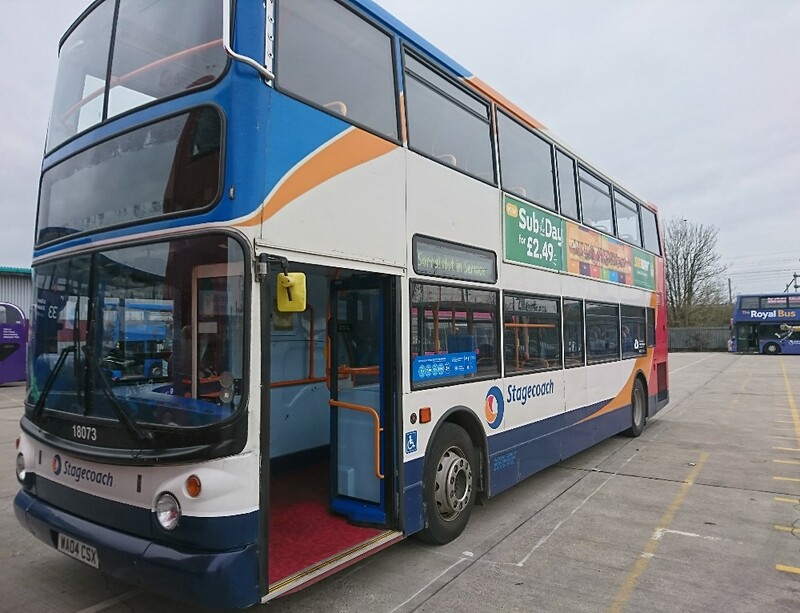 Stagecoach in Oxfordshire Managing Director Martin Sutton has announced he will retire from the business this year after 46 years’ service in the bus industry. 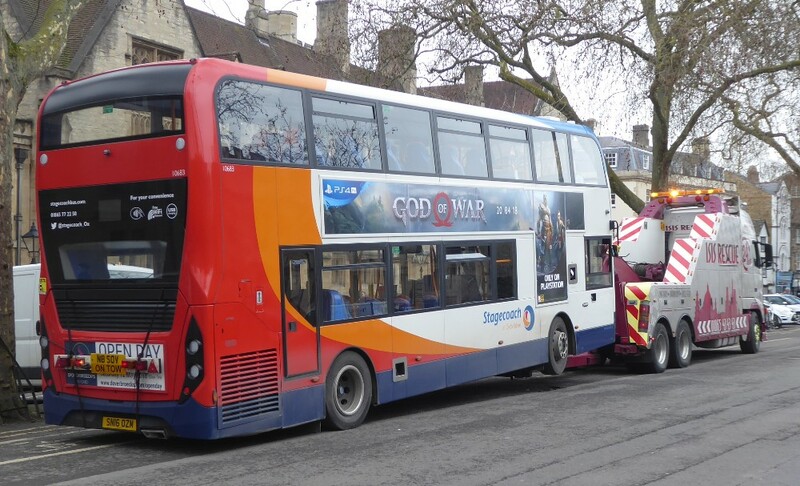 Martin, who began his career in 1972, and has been Managing Director of Stagecoach in Oxfordshire for the past 14 years, will step down on 5 July. 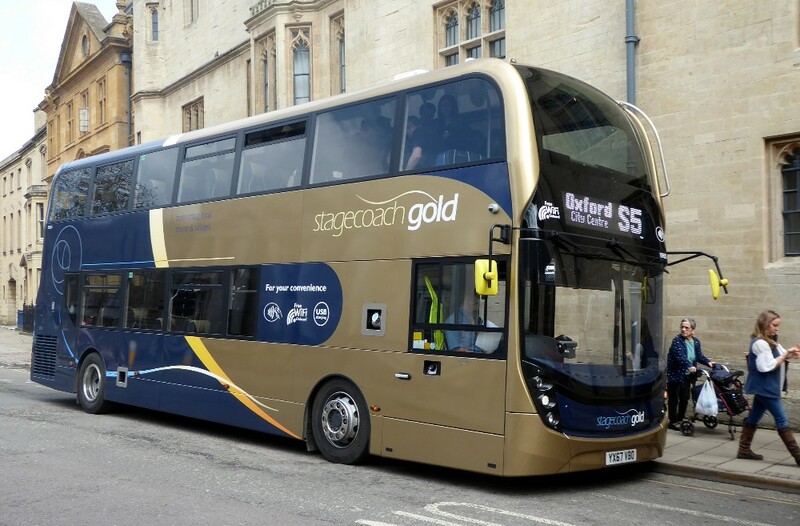 Stagecoach expects to confirm a new Managing Director of Stagecoach in Oxfordshire shortly. Martin Sutton began his career with Trent Motor Traction Co. Ltd. In Derby, and after time spent with several different operators, he joined Stagecoach in 1997, when he was appointed Managing Director of Stagecoach Cheltenham & Gloucester (now Stagecoach West). 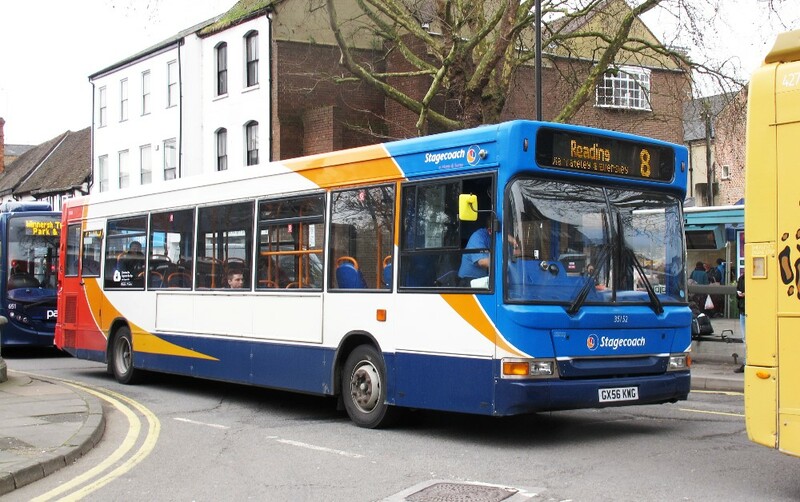 In 2000, Martin became Managing Director of Stagecoach South Midlands until, in 2004, South Midlands was divided into two – Stagecoach Midlands and Stagecoach in Oxfordshire, at which point he took on the role of Managing Director, Stagecoach in Oxfordshire. 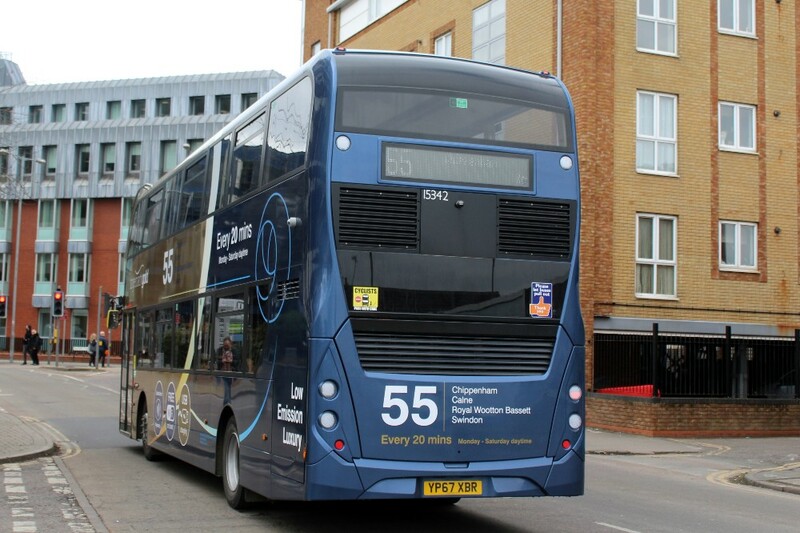 Stagecoach UK Bus Managing Director for England and Wales, Mark Threapleton, said: “I would like to thank Martin for his commitment and the valuable contribution he has made over many years to deliver improvements for bus passengers across Oxfordshire. 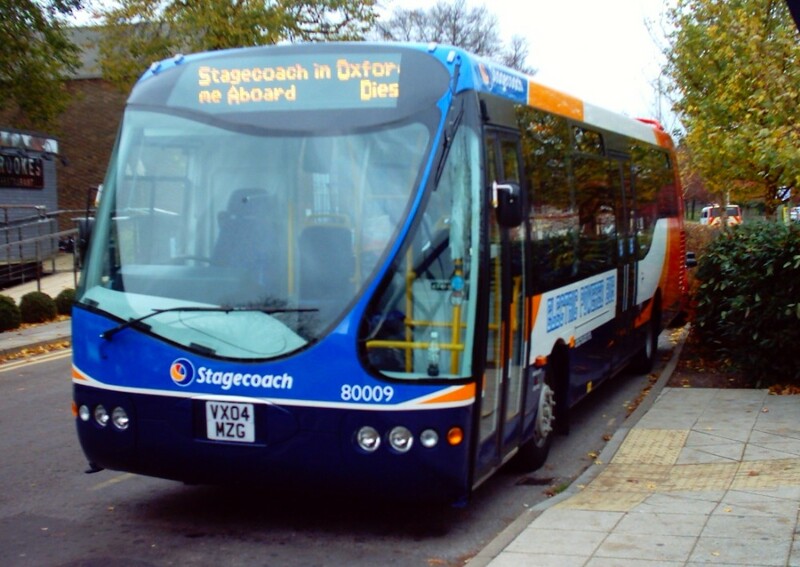 Stagecoach in Oxfordshire has more than 550 employees and a fleet of almost 180 vehicles. 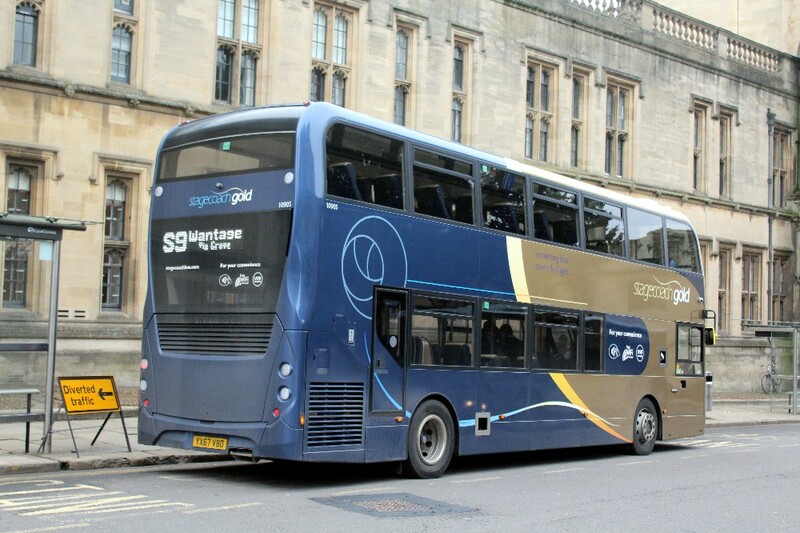 The company operates bus services throughout Oxfordshire as well as the Oxford tube, providing express coach service between Oxford and London and carries around 19 million passengers a year. The invasion of Park & Ride sites by travellers. I will be adding any current news items and one which hit the local headlines earlier in the week was the invasion of Park & Ride sites by travellers. 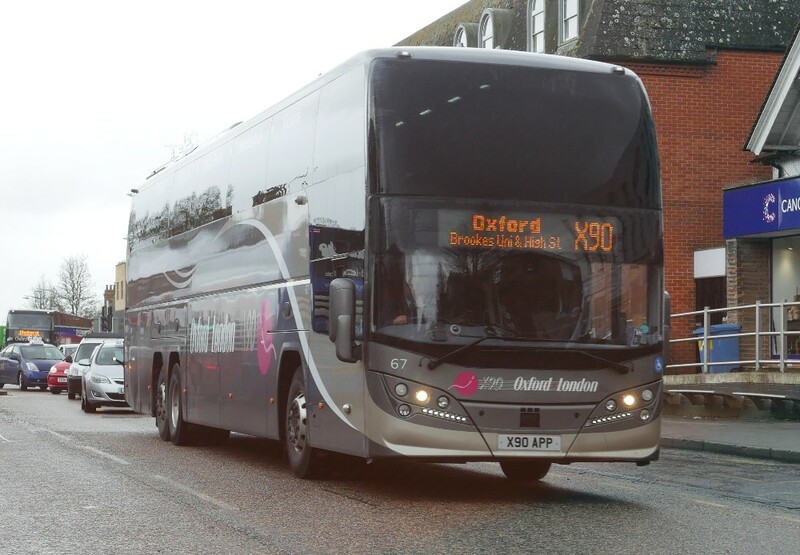 Bicester is the latest site to face problems and one must sympathise with users who must finding leaving their cars a challenge and maybe results in less users and more commuters. Oh, that is a slogan isn't it? "Less users means more Commuters". Surely it is time that the authorities tackled this whole business head on and got tough with offenders. 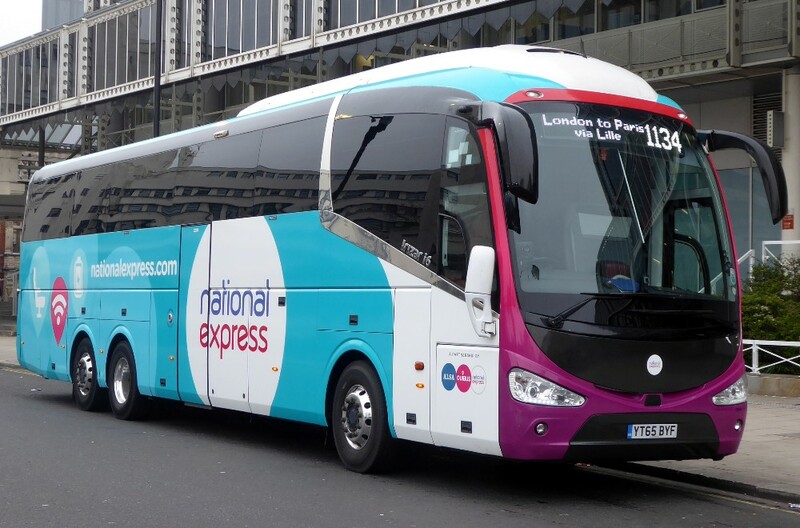 It has hit the bus companies quite hard as they have lost revenue. Indeed only last week comment appeared in several national dailies regarding this problem with reports saying "POLICE could be given new powers to crack down on travellers and Gypsies acting illegally as trespass laws look to be tightened up after nearly 4,000 caravans were counted on unauthorised on sites across the UK. Aggravated trespass is already a criminal offence in England and applies to people who enter land and intimidate the landowner or others. But the legislation could be beefed up to bring it into line with the law in Ireland where it is illegal to enter and occupy land without the owner’s permission or bring any object on to the land if it is likely to cause “substantial damage”. Irish police also have the power to order trespassers to leave land if they suspect an offence is being committed." Let's watch this developing situation and how it is affecting our local area. If anyone has pictures of affected Park & ride sites please send them to me. Open top tourist bus accidents - questions of concern. We all love the experience of riding on an open top bus but there are some hazards which provide unexpected results. I read with interest, in the national press, the outcome of an accident with a London open top sightseeing bus where a passenger was injured, he was left with very serious injuries to an ear , the operator subsequently admitting liability. The injured tourist had been sitting under the covered front end of the bus and when the roof was ripped off the tourist suffered the injury. Then just this week I see that an accident took place in Malta, where the outcome was far more serious. There two tourists were killed and six others critically injured after a double-decker bus hit low-lying tree branches in Malta. At least 44 others have been treated in hospital following the incident on Valletta Road, Zurrieq, last Monday. Victims in critical condition included three Britons: two boys aged six and eight, and a 44-year-old man. The others were a German woman, 31, an Italian woman, 72, and a 35-year-old man whose nationality has not yet been confirmed. Some thoughts come to mind about such matters, mainly due to training. When taking PCV training the matter of overhead obstructions such as trees, road furniture and building are normally emphasised by the instructor. Care has to be taken when driving high vehicles and such accidents should never happen. There is however one problem and that is who is responsible for overhanging trees? Many years ago bus companies took responsibilities and often provided vehicles to trim trees. Now it seems that law does not allow this to be done by the bus companies and local authorities are deemed liable. Hence the over engineered "tree bars" on many modern double deck buses. 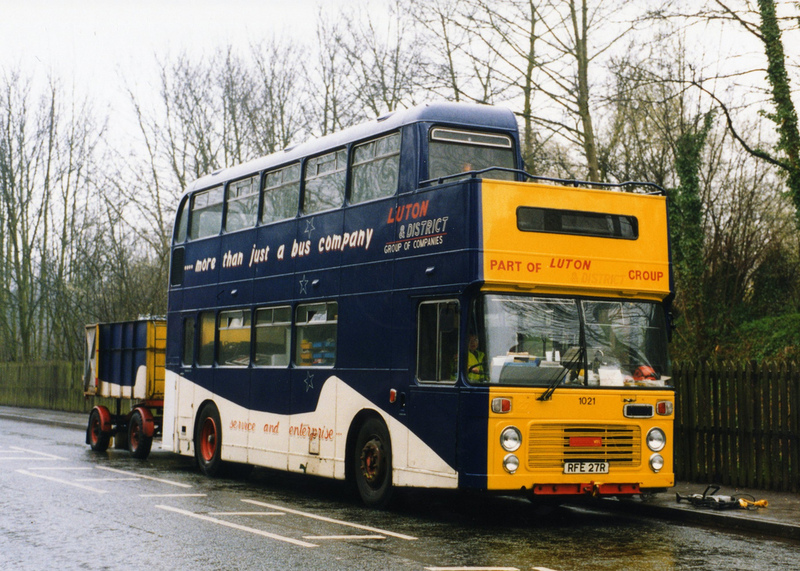 Luton & District Bristol VR tree lopper RFE27R in 1995 taken by Mark Bowerbank. 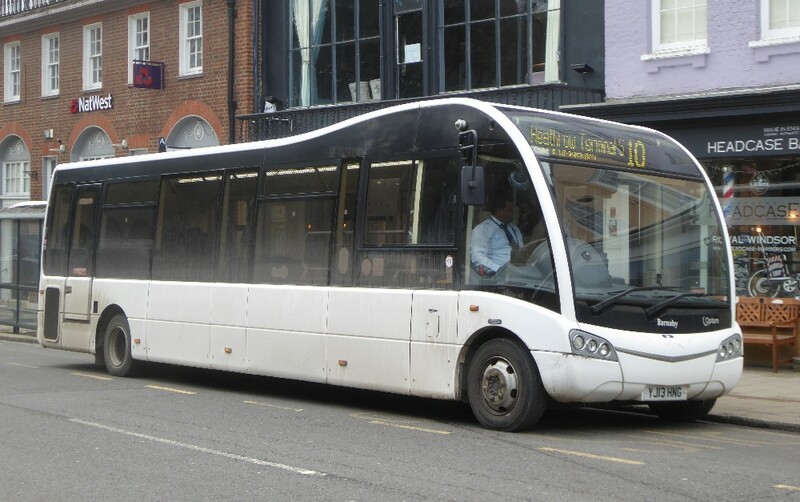 This bus came from Lincoln to Luton and then moved to Aylesbury where in ran for a while in Lincoln area livery. and scrapped sometime before the end of the 90s. I am sure I pictured it in High Wycombe around those years but cannot find the picture at present. Maybe the time has come for such matters to change? More specialist training for open top bus drivers. Maybe these thoughts will not be popular with some operators, already taking great care in their training and who have enough to contend with at present but in these days of health and safety concerns, open top buses may become a target if not dealt with properly. Indeed with traffic levels ever increasing in volume, it is not so easy for drivers to negotiate our modern and not so uncongested highways. 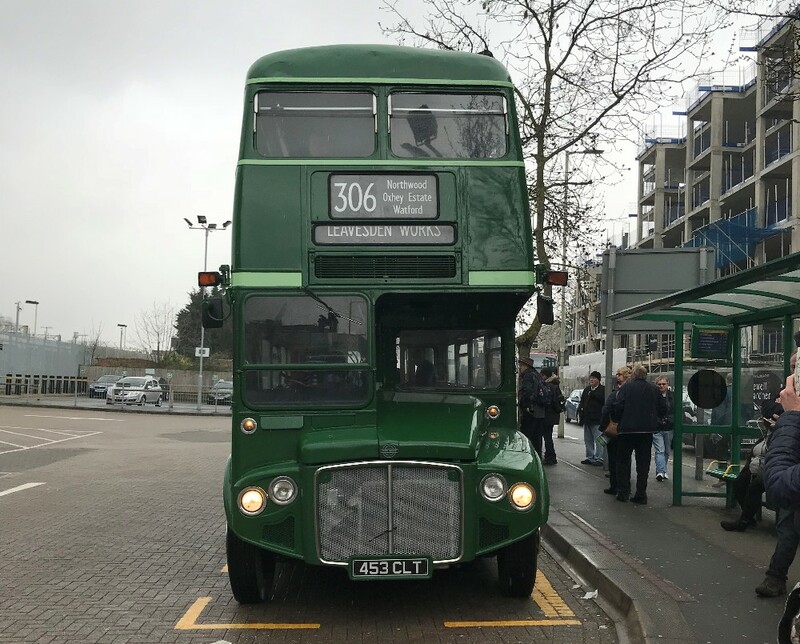 IanVisits organised an interest rally in early April when their first running day for 2018 was based at Watford Junction bus interchange. 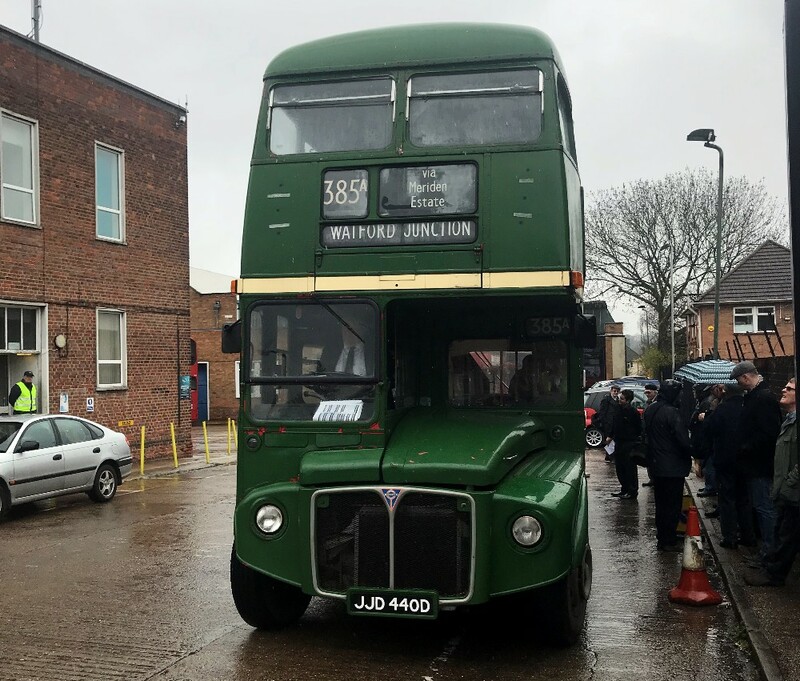 As well as recreating various green London Transport routes in and around the Watford area, they also be ran buses to and from Garston Bus Garage from 11.30 onwards on that day. 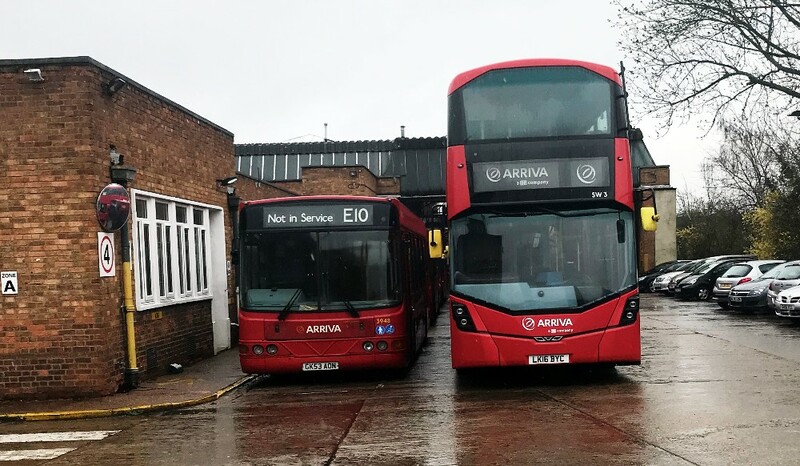 This famous garage is due to close this summer, and Arriva London allowed them to run arriving buses through the garage with passengers on board. 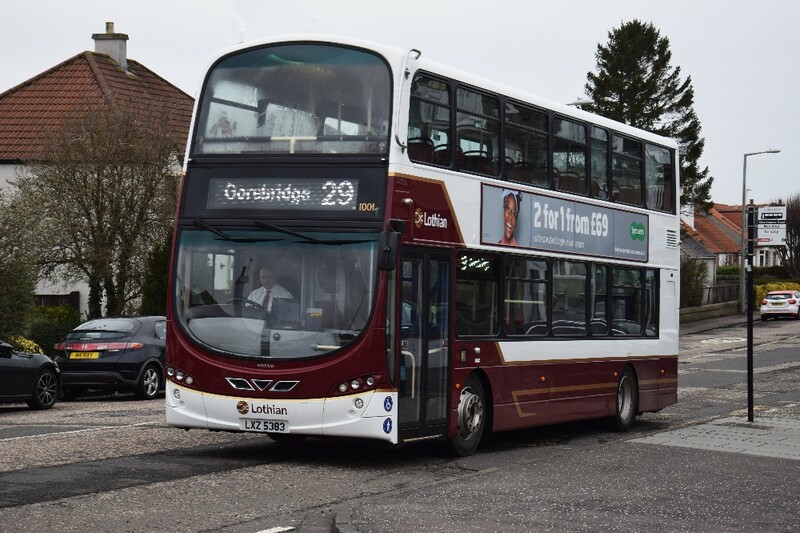 Mark Turner was present on the day and took the pictures shown below of buses in use on April 8th. AEC Regal T792 HLX 462 dating from 1948 seen with RMC1497 in the exit from Garston garage. A couple of the current occupants of Garston being Arriva's 3948 and SW3. 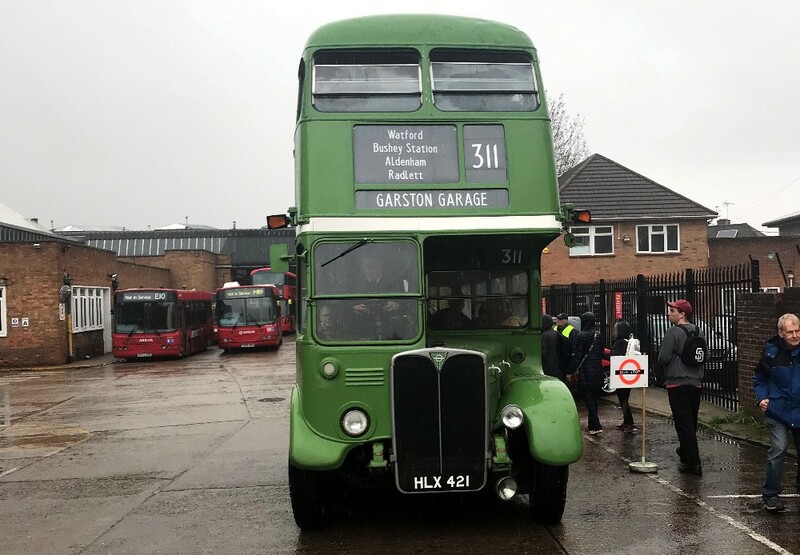 A now rather famous RML for local enthusiasts, 2440, often to be seen at Arriva's Cressex garage, is seen at Garston on the day. 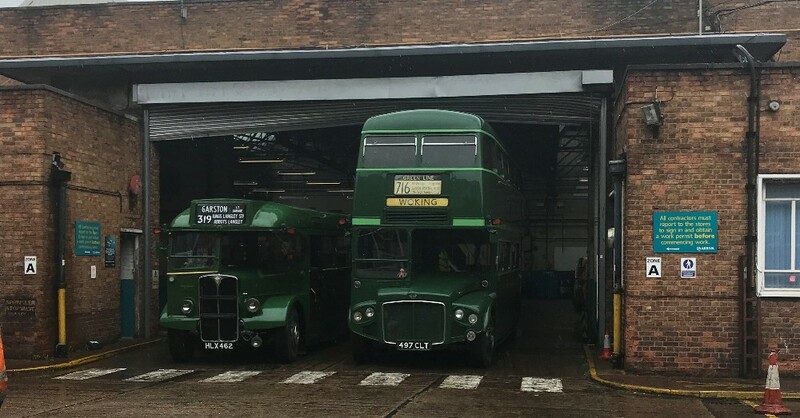 This time, RT604 - HLX 421 a green AEC Regent III with a Weymann body, new July 1948 and now owned by the Purley Transport Preservation Group, Surrey. RT 604 was delivered new in 1948 to the LT country area at Tring in Hertfordshire, with a roof box body. During overhaul in 1956, she was filled with a standard Weymann body. The vehicle remained on country service north of the Thames, until 1970 when she was transferred to London Country, where she served south of the Thames as well. 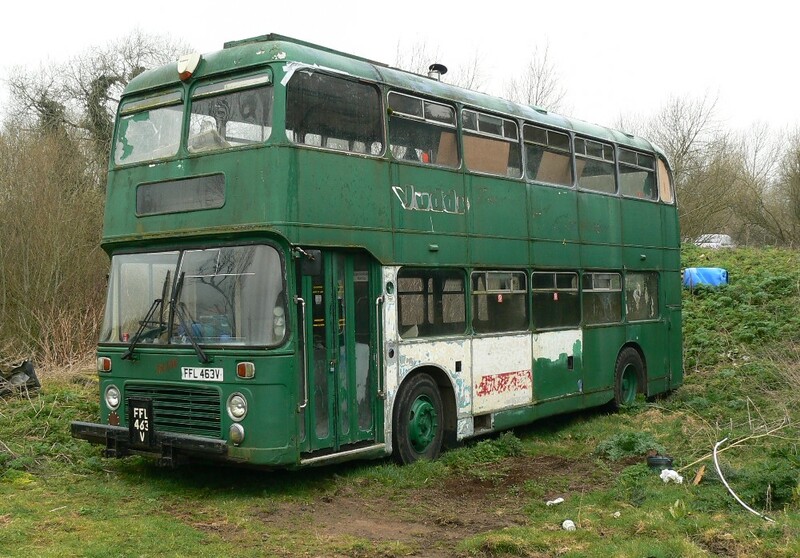 In 1977 she received the National Bus Company "leaf" green livery, which is retained in preservation - it is thought that only three RTs were painted in this colour. RT 604 has the distinction of being the last RT in service with London Country, working on route 403 out of Chelsham Garage, in 1978. She was sold for preservation in 1980, and was bought by the present owners in 1991. She has been active on running days and at shows since 2003. Green Line liveried RT3228 KYY957 showing blinds for the short lived Express service 803, a nice touch at this event. Another RML is 2456 seen in traditional London Transport country area livery. This vehicle entered service at Harlow garage for the LT country area in 1966. In 1970 she was transferred to the newly formed London Country Bus Company, and in 1972 was moved to Staines. During 1978 she was repainted in the NBC leaf green livery but the next year was repurchased by LT, painted red and allocated to Hanwell garage. With Stagecoach she operated the 15 and then route 8 out of Bow during 2003-4. Finally we can see RMC1453, one of the rather nice Green Line double deck coach versions of the RM. 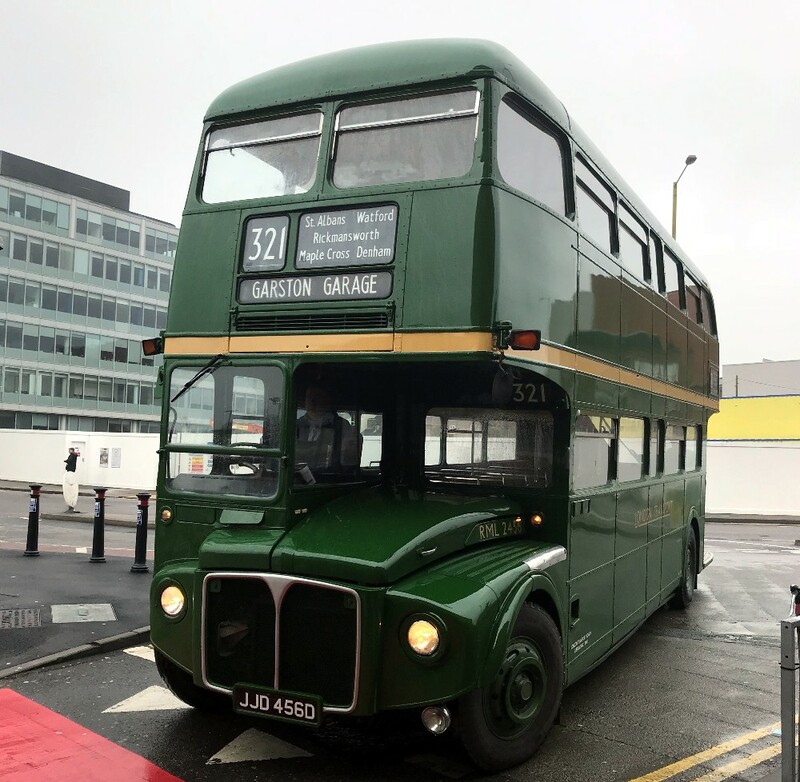 This was the first production Green Line Routemaster coach introduced in 1962. This seems to have been a memorable day and I am pleased we had Mark's pictures to show some detail for readers. 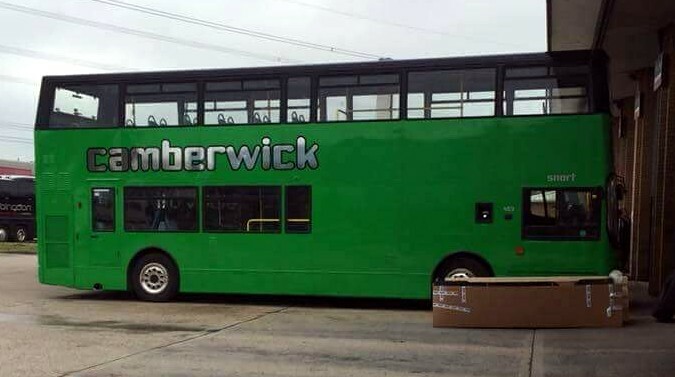 Marcus Lapthorn writes "When I was riding back from Swindon on the top deck of a 66 route bus on Saturday, I had a fleeting view of a green bus in a farmer’s field near Faringdon. 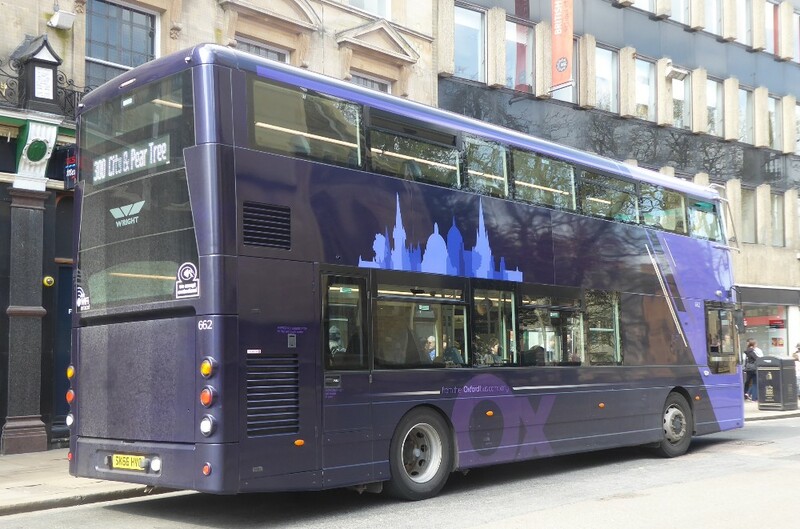 Today I went by car to investigate and I attach a ‘photo of the bus which was new as West Riding YUM516S according to the Bristol bus website. I believe that it is the former Emblings /Judd Bristol VRT. It is possible that this bus has not been seen for seven years, as it was last recorded as being in a farmer’s field in Lancashire!" Marcus, you're correct it was latterly with Emblings before conversion to a mobile home. FFL463V new as 805 - YUM516S new to West Riding but actually ordered by Yorkshire Woollen and was a Bristol VRT-SL3 ECW H43-31F delivered in February 1978. That Radio Oxford Bristol VR. Giles Woodforde writes "Great memories! 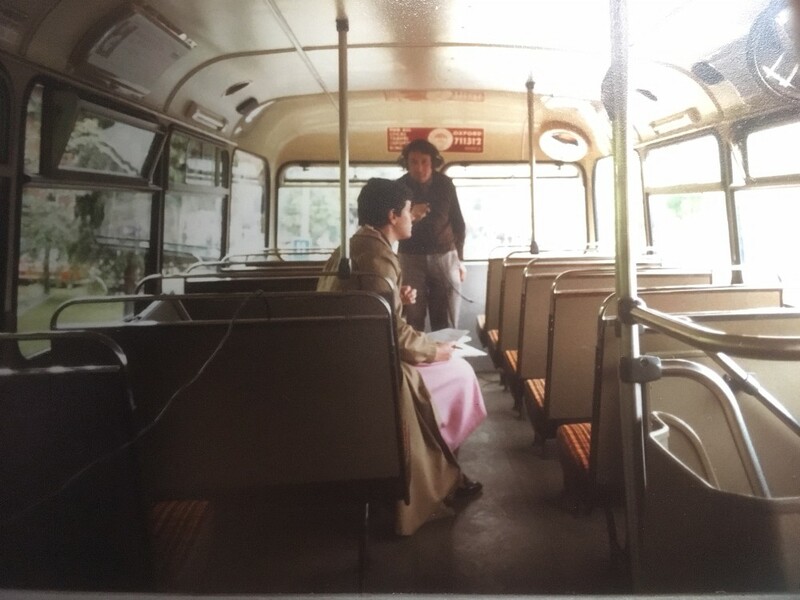 Not good enough quality to reproduce I’m sure, but the attached shows yours truly conducting a Radio Oxford interview on the upper deck of the Radio Oxford bus in July 1983. 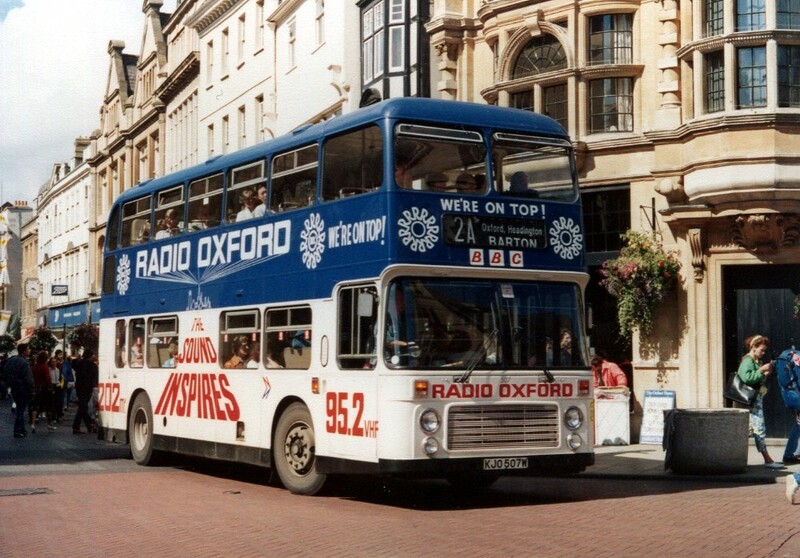 Radio Oxford programmes were broadcast live through loudspeakers on the upper deck only - so you could avoid presenters you didn’t like by remaining on the lower deck! " 507 KJO507W supporting Radio Oxford circa 1986 by Nigel Lukowski. 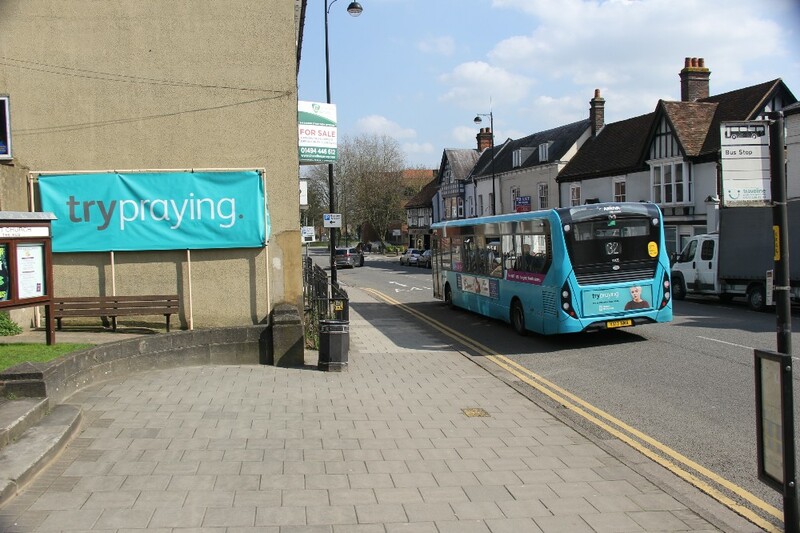 (1) Arriva MMC E20D 3105 passes a ‘trypraying’ banner outside the Baptist Church in Easton Street on route 32 to Micklefield. (2) Arriva small Streetlight 2526 ‘Peter’ crossing the Amersham Hill railway bridge on a 33 to Totteridge. 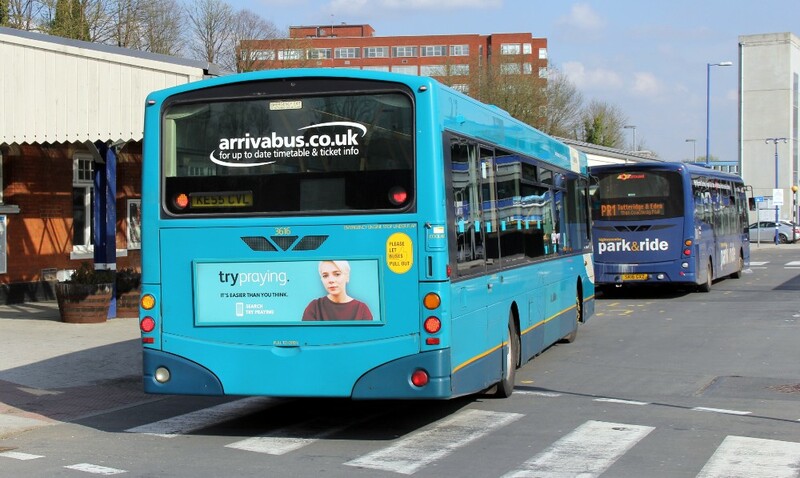 (3) Arriva 3616 a Wrightbus bodied Scania at the railway station interchange. (4) Carousel MAN/MCV Evolution 419 ascending Castle Street on a 1A to Chesham Pond Park Estate (the A denotes not via Stanley Hill in Amersham). I rather liked this piece from Frank and hope readers will appreciate the irony of his writings? Our next meeting will be on Tuesday 17 April at The Tee Hotel, Church Way, Oxford, OX4 4EY, starting at 7.15 p.m.
As usual there is a wide variety of English and Indian food available beforehand. This will be our Annual General Meeting, which will be followed by a "Show and Tell" time. Please bring up to three items of interest to members, other than photographs, for what I am sure will be an entertaining and interesting evening. Hants & Surrey Bus Blog. I mention this site as it has some items of interest regarding Reading and Courtney. Check the link below. Lothian, apart from regular deliveries of new buses has also acquired a number of ex London buses. 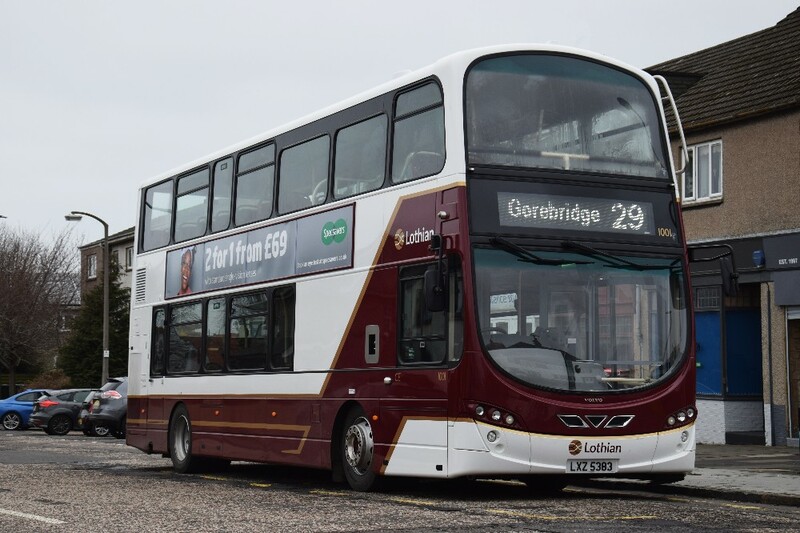 Gordon Scott has provided pictures of Lothian's 1001 - LXZ 5383 a Volvo B9TL with Wright Gemini bodywork ex London Tower Transit 37978 - BG61 SXJ and seen at Silverknowes Edinburgh on route 29. Tony Bungay writes "Thank you for info on 3866,as you say it seems much travelled! There is another similar at Aylesbury I saw it working the 150 to Milton Keynes on April 9th. I was unable to get the fleet number however, the first part of the registration being KE05. I haven’t seen either since, not that it means anything, so whether they are at Aylesbury short or long term is unknown? One photo of possible interest MMC400 sapphire 6526? was caught on a 500 working on a rather dreary April 11th, seen here in Aylesbury. Not the best photo I'm afraid due to a mixture of poor light, higher iso and snatching a gap through Aylesbury’s constant traffic. Yes, it is 6526 an much appreciated. April 11th by Tony Bungay. 6525 on the Green Line 758 turns on to Elizabeth Bridge and waiting at the lights on Buckingham Palace Road on April 11th by Gavin Francis. One wonders if they had enough branded buses for the 320???? 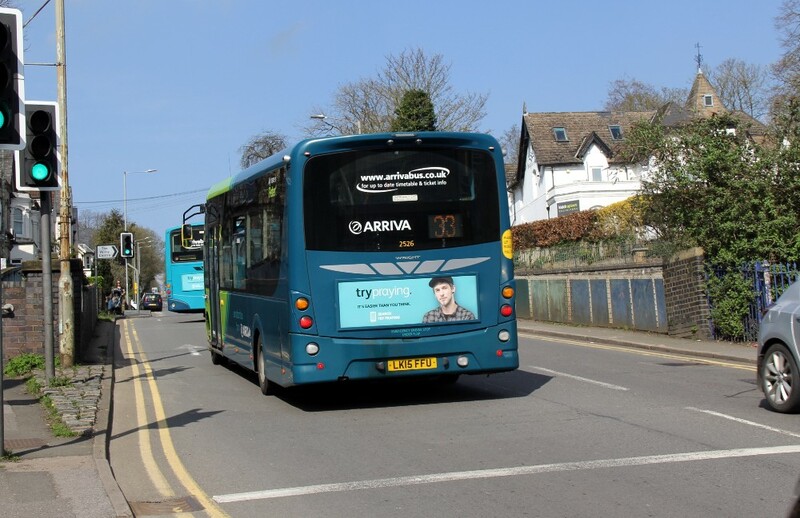 Nigel Peach writes "This morning (Monday 9th), I pulled up behind Arriva 6303 in Loudwater. I attach a picture. 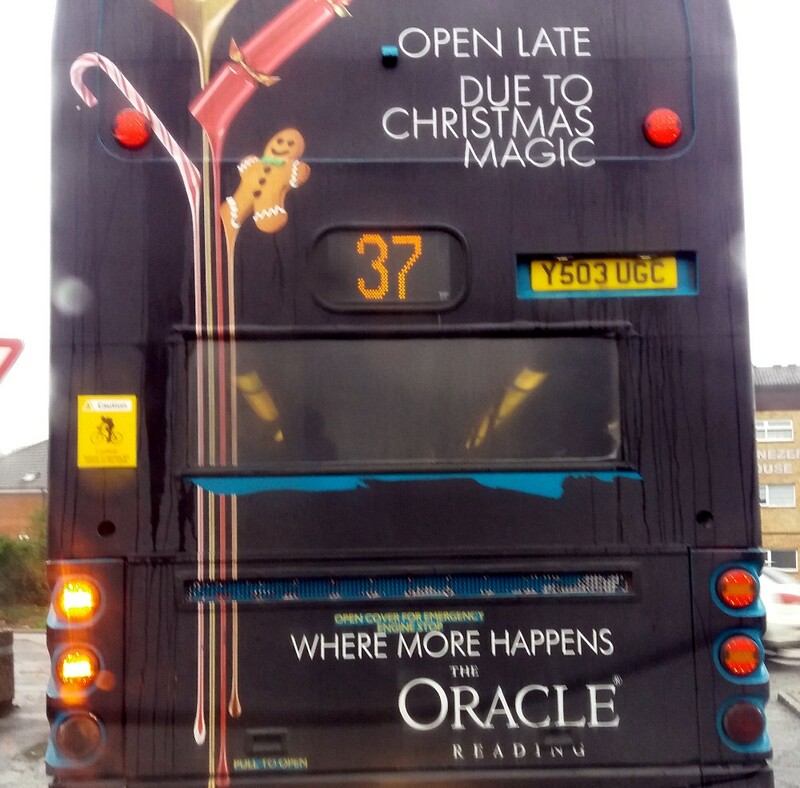 You will see that it has a Christmas advert for the Oracle in Reading - well, Christmas is less than nine months away. 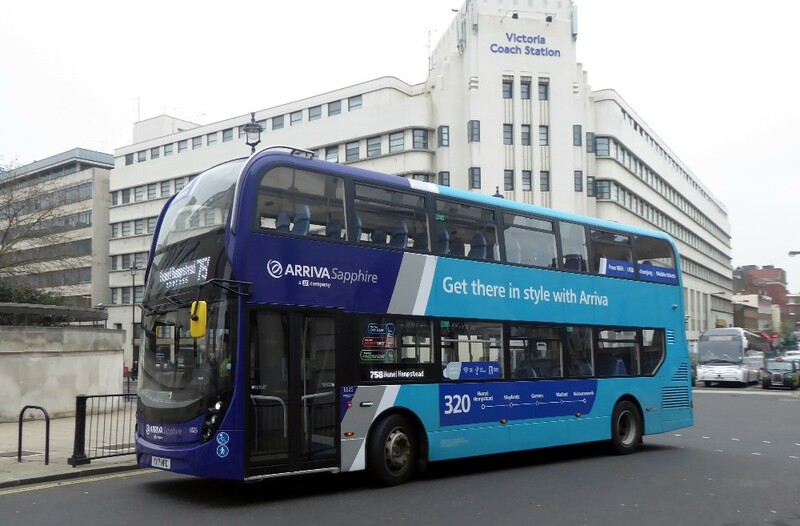 An irony is that Arriva have withdrawn a number of this batch of buses, and I would not be surprised if 6303 has gone by the time next Christmas is here." Now are we early or late with this super rear by Nigel Peach. It's on 6303? Southern Counties 4076 YX17NGJ at Epping Station on the 9 but branded for the 508-10 group of routes on March 19th by Paul Bateson. A comparison picture for the new batch at Wycombe and Luton. 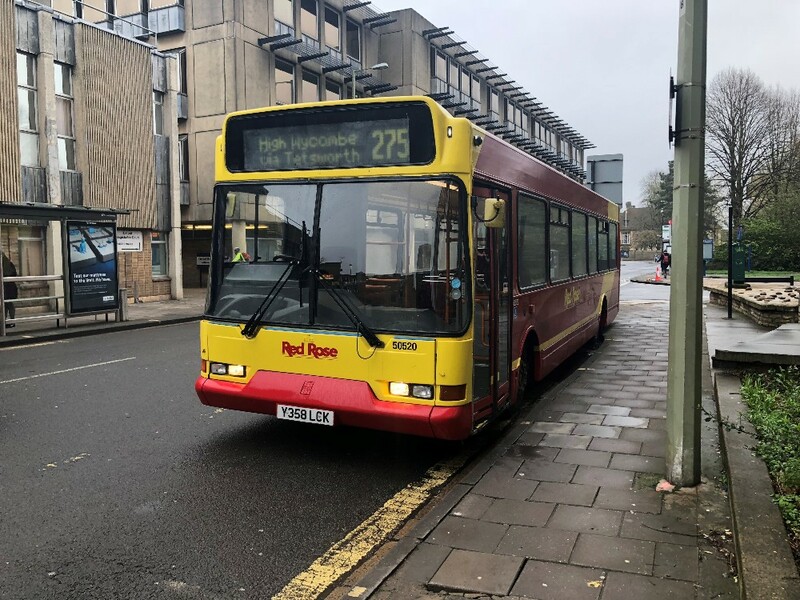 This operator has a route network of 29 basic routes with variations plus it operates a special service for Milton Park Estate in Didcot. 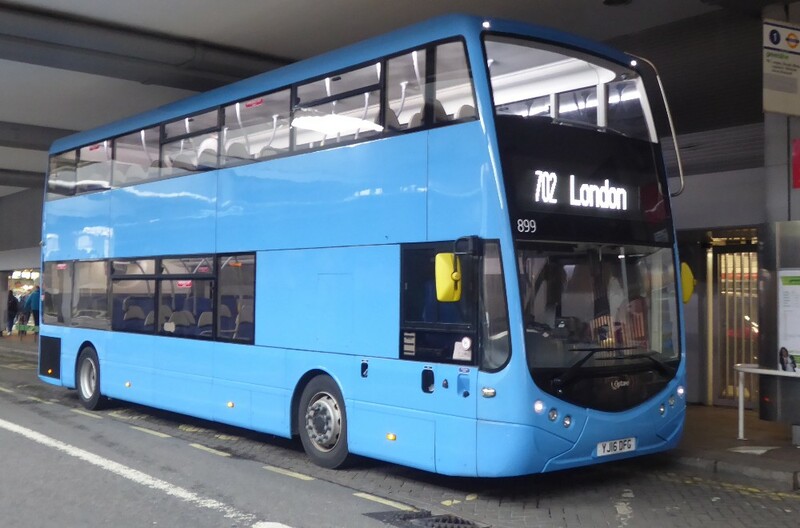 The fleet comprises around 70 buses and includes four double decks, three in Milton Park livery and the 18 plate mentioned below which has just arrived. 23 are Optare Solo SR's and there is a significant batch of ADL E200's delivered in 2017. Various liveries are used making this a very interesting fleet. This operator provides the service for Milton Park at Didcot and has another new decker but has this been to Didcot? I wonder? An interesting fleet with a great deal of variety and somewhat haphazard owner indication. Solo SR YA13AAE on the 2 in Windsor. YJ13HNG works the 10 when seen in Windsor. YD63VBO another Solo SR working the Maidenhead 16 in Windsor again. Stephen Le Bras, one of my regular correspondents, has recently been having some hospital treatment and I am sure we all wish him well. His reports helped the page greatly. 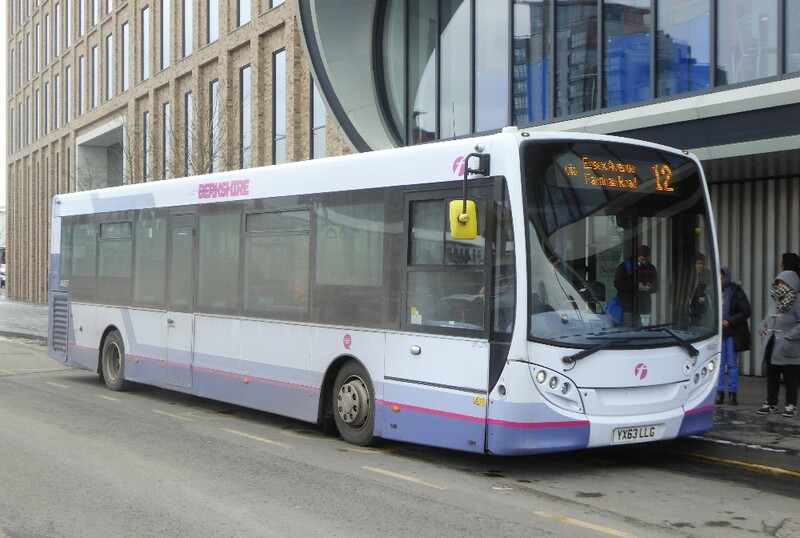 First Berkshire 44567 YX63LLG working the 12 local route in Slough on March 19th by Paul Bateson. I am led to believe that route changes and the cessation of services is not yet over. Only time with tell. Graham Low reports that Citaro 877 was on City 13 on April 11th and asks isn't this usually with Carousel? Maybe my comments on 878 last week has prompted some changes. 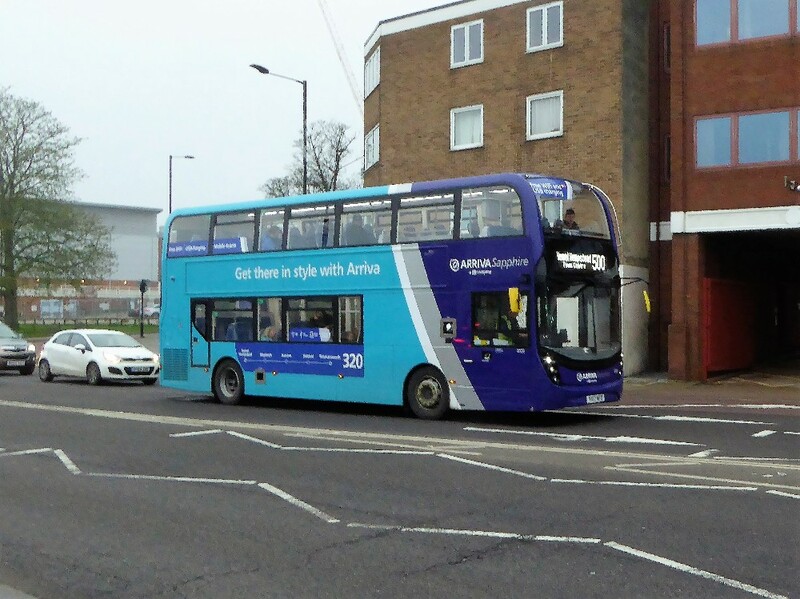 Buses on routes other than their branding suggests, with X80 branded deckers working to Uxbridge and Flackwell Heath. 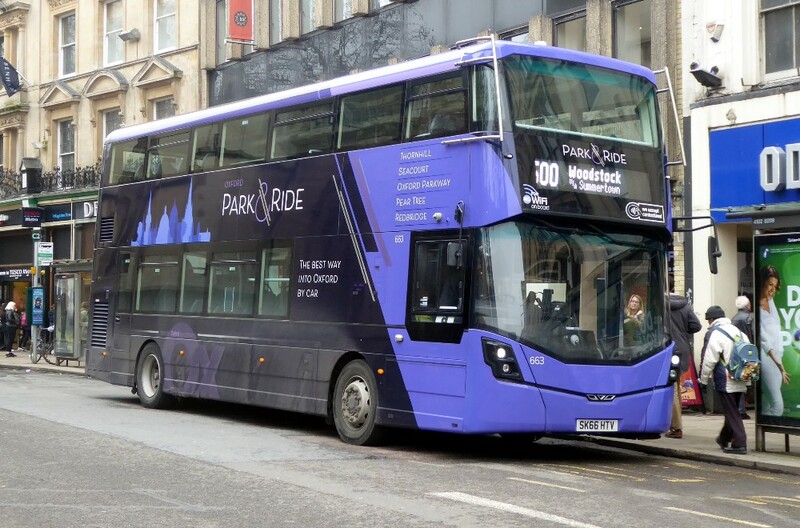 Some unexplained goings on with this operator have occurred over the past week with de-branded Park & Ride 662 appearing on the Abingdon-JR route and others as well as it's original P&R routes. So far no reason for the debranding has been revealed. 662 with main branding removed working the 300 on April 14th when seen by Gavin Francis. Another strange sight was 663 with the route number on the right hand side against UK regulation rules. Seen on April 11th by Gavin Francis. On should add that Oxford Bus are not on their own as will be seen under Megabus lower down this page! 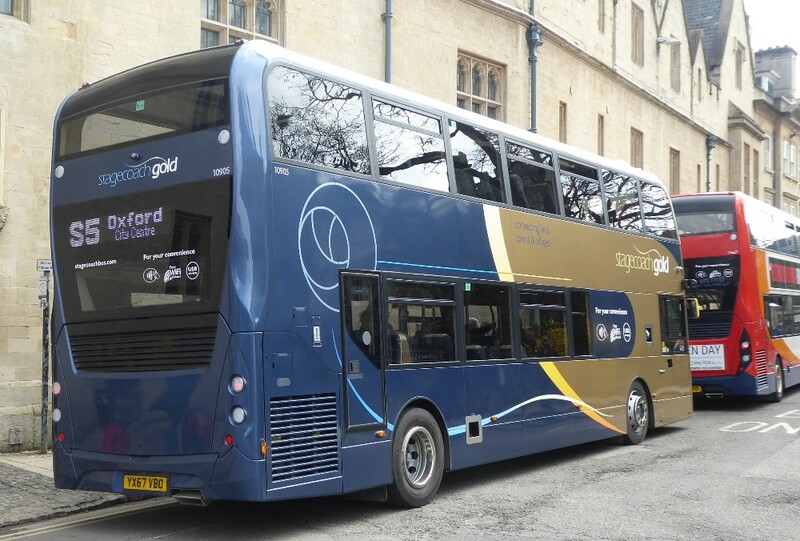 Oxford's X90 coach 67 heads towards Oxford through Headington on April 4th by Malcolm Crowe. 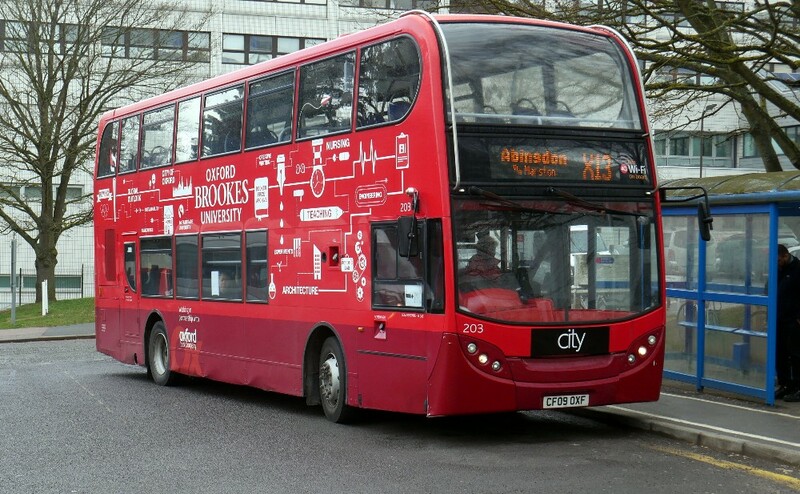 Ralph Adams writes "201 has City applied at the front over Brookes Bus logo and used on local services. Nothing unusual as it is Brookes vacation (the City logo can easily be removed) and there are several spare red Brookes buses available, a regular feature, also two normal buses spare from 35A/B as school holidays. The 3rd bus does peak work on 35. So several spare deckers. On route 3A was 313. This route can be either single or double deck as loadings not excessive. So a straight swap of 313 and 837 or bringing in spare Brookes bus would to me make more sense. Re Malcolm’s weekly briefings, 869 on TT route X39/X40. This is probably one of the many one day loans when a bus undergoing service at Cowley is not ready in time. 869 / 870 are quite often seen on TT routes and also on COMS routes. 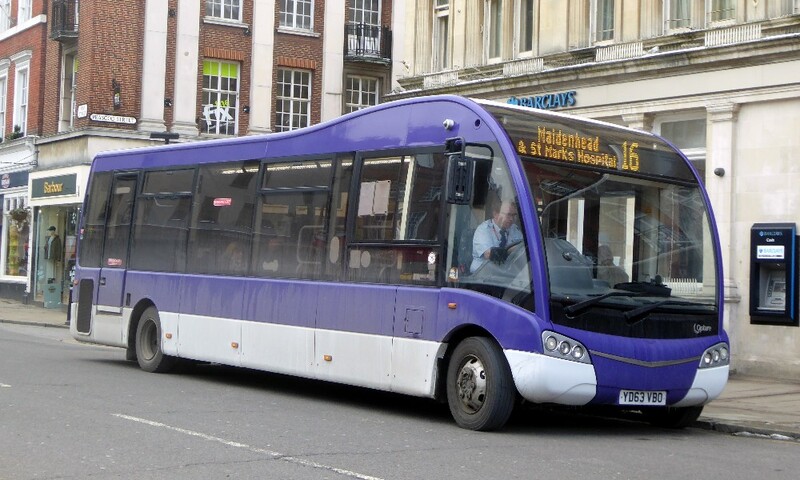 The bus destinations are programmed for all COMS and TT routes to enable flexible use." Following Ralph's report above, Brookes 203 with a City panel in black works the X13 at JR on April 4th by Malcolm Crowe. is seen on Elizabeth Bridge on April 13th by Gavin Francis. This Wheatley based operator has a new delivery continuing the standard type of coach. I do not as yet have any pictures to hand. Details are shown below. The only photo I can trace is at the link below, somewhere in London, before the coach received any branding. First of all we can refer to the current take over of Stagecoach routes into Reading. 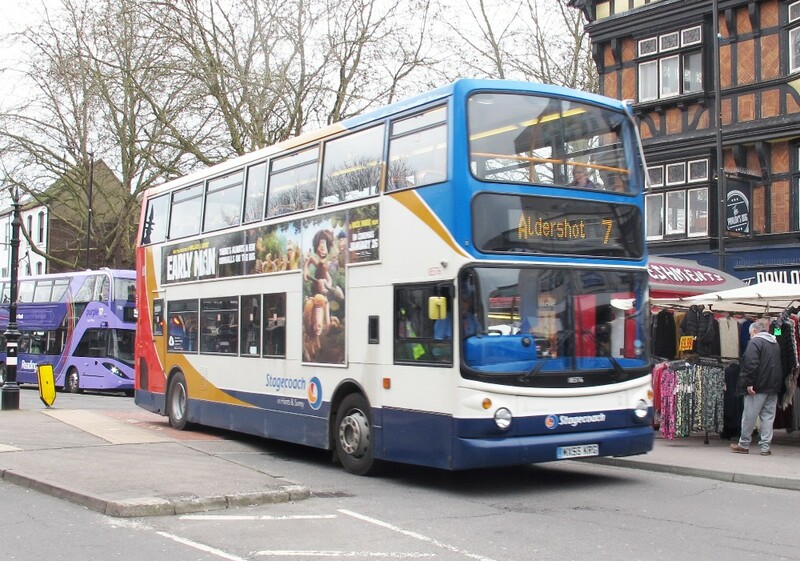 · Stagecoach route 7 will operate along the current route between Aldershot, Fleet, Elvetham Heath and Hartley Wintney. The service will then continue to serve Phoenix Green, offering new links for this area. 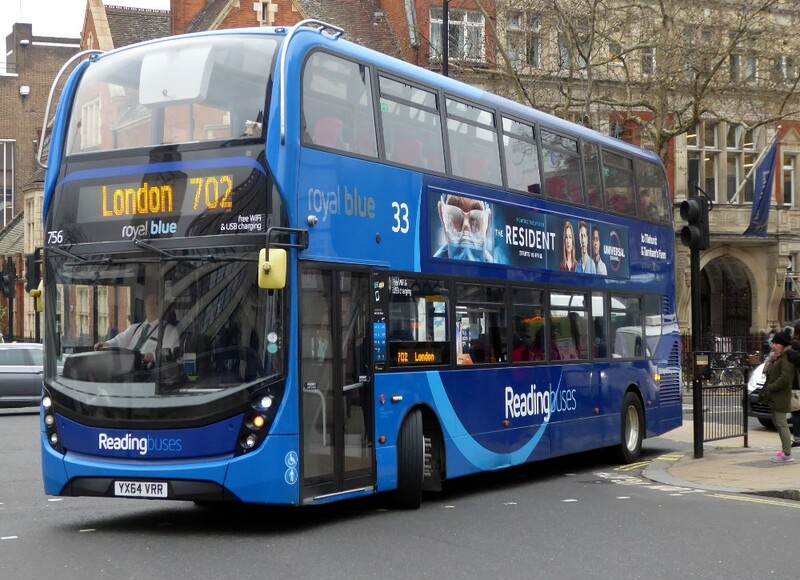 The Reading Buses web site. 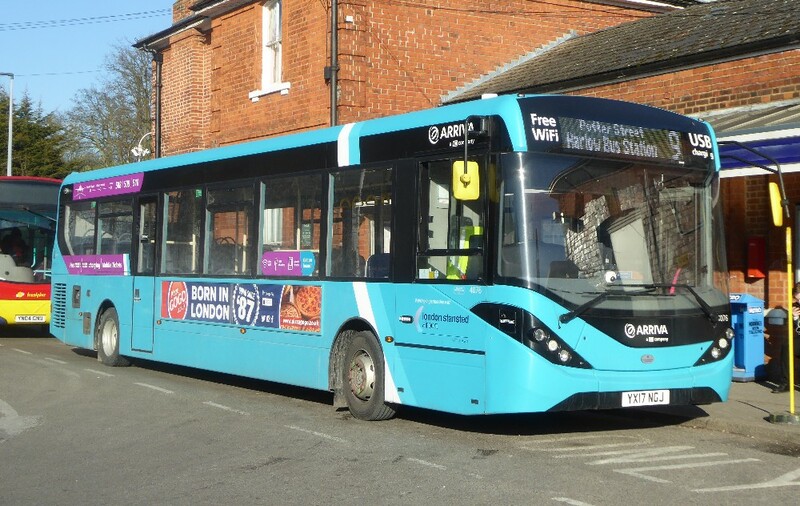 There will be a completely revised timetable, including an additional afternoon journey from Aldershot on weekdays and an earlier journey from Hartley Wintney on Saturday mornings. Buses will be re-timed to give better spaced departures in both directions. The hourly Monday to Saturday frequency is unchanged. 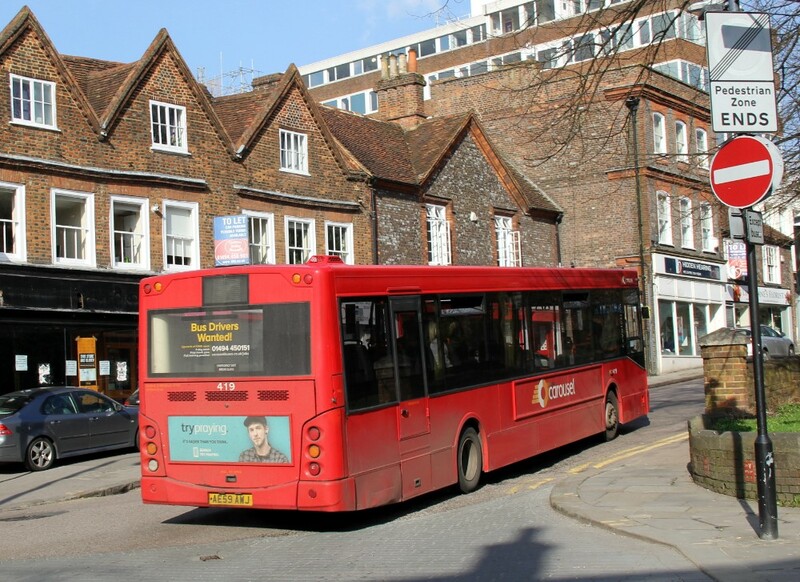 Stagecoach route 7 will be extended from Hartley Wintney to Phoenix Green in a one-way loop, via London Road, Dilly Lane, Mitchell Avenue and Green Lane. Buses will then return towards Fleet and Aldershot. Some additional early morning and evening journeys will run via Fleet Station to provide connections with commuter trains. Three evening journeys in each direction will now serve the station, to connect with train arrivals from London Waterloo. 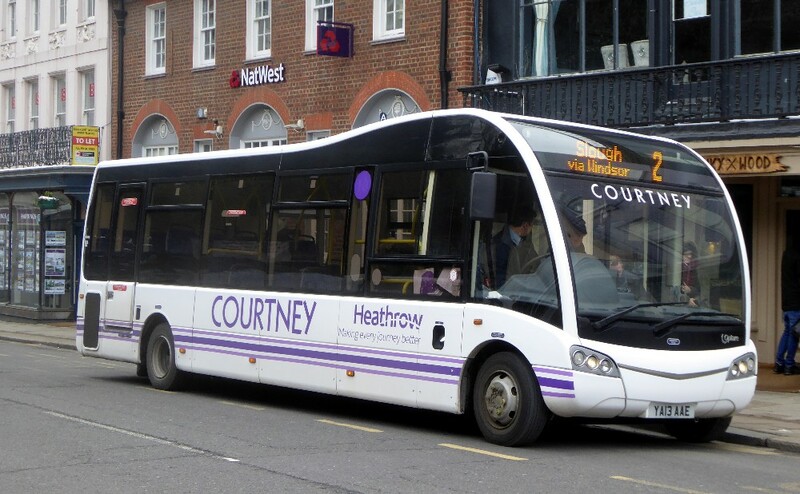 Customers making the journey across Hartley Wintney onwards to/from Reading are advised to change buses at Hartley Wintney. Through single and return tickets will be available on both operators' buses. 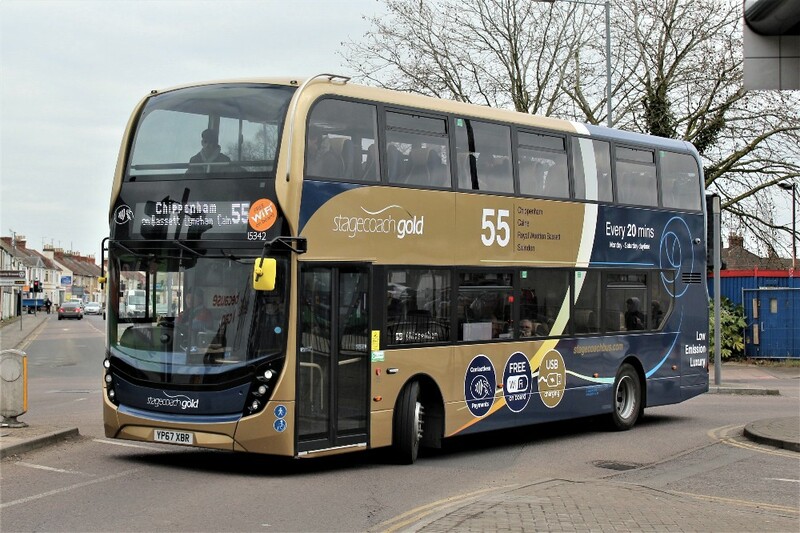 Stagecoach's Dayrider Gold ticket and Reading Buses' SimplyNetwork day ticket will be valid for travel on both services. Route 8 will be withdrawn after operation on Friday 13th April 2018. The section of route between Reading and Riseley will be covered by an hourly service on Reading Buses route 7. Between Eversley, Yateley and Farnborough, a partial replacement will be provided by routes 406 & 408 (see below). We regret that there will no longer be a through link from Reading to Farnborough owing to low passenger numbers. 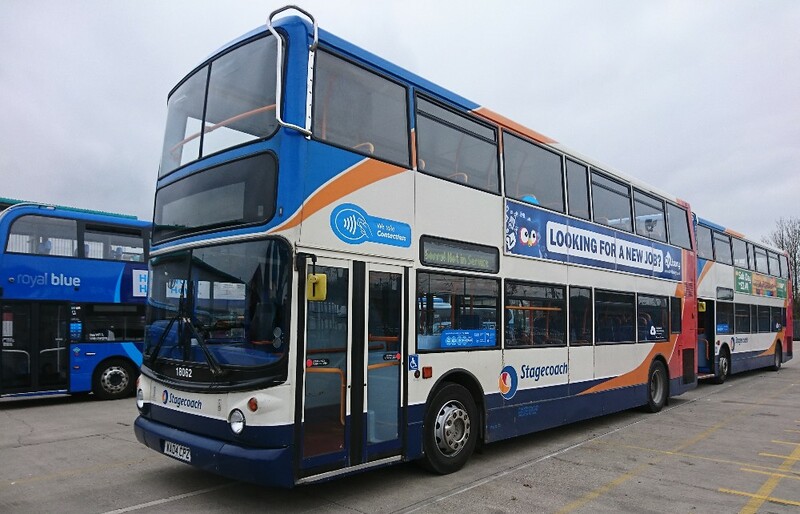 David Rouse writes "Two Stagecoach Tridents arrived at the depot on April 13th at about 4pm!" David included the two pictures below. History of the two Tridents. Stagecoach 18062 (Stagecoach Devon) WA04CPZ seen on 04/05/13. Exeter bus station. A Dennis Trident chassis and Alexander ALX400 body. [Route 50] at the link below. 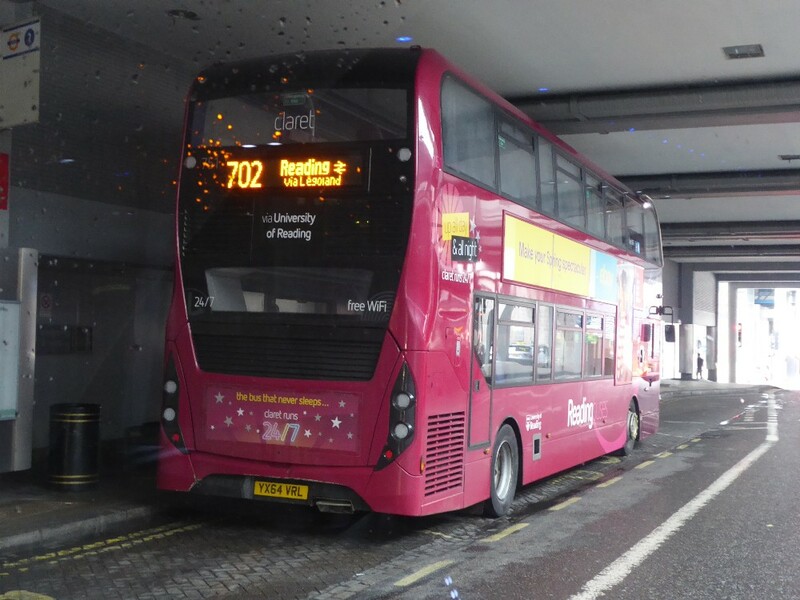 Bob Morley also wrote saying "This weekend sees the exit of all Stagecoach services into Reading with the complete withdrawal of service 8 and the take over of service 7 by Reading Buses between Reading and Fleet." 14.05hrs Stagecoach service 7 from Aldershot arriving in St Mary’s Butts, reading on Friday, April 13. 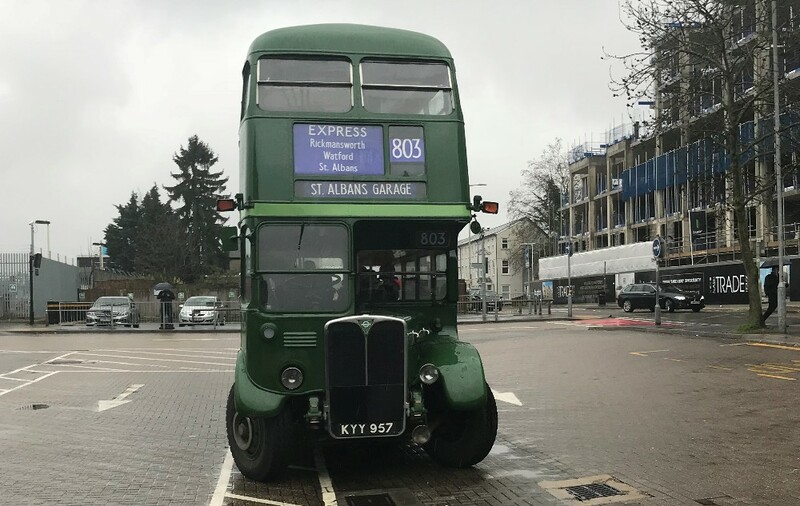 The next day was the last day of the service, the following Monday Reading Buses took over the service but only as far as Fleet..
15.00hrs Stagecoach service 8 from Kingsmead, Farnborough arriving in St Mary’s Butts, Reading on Friday, April 13 the last day of service. 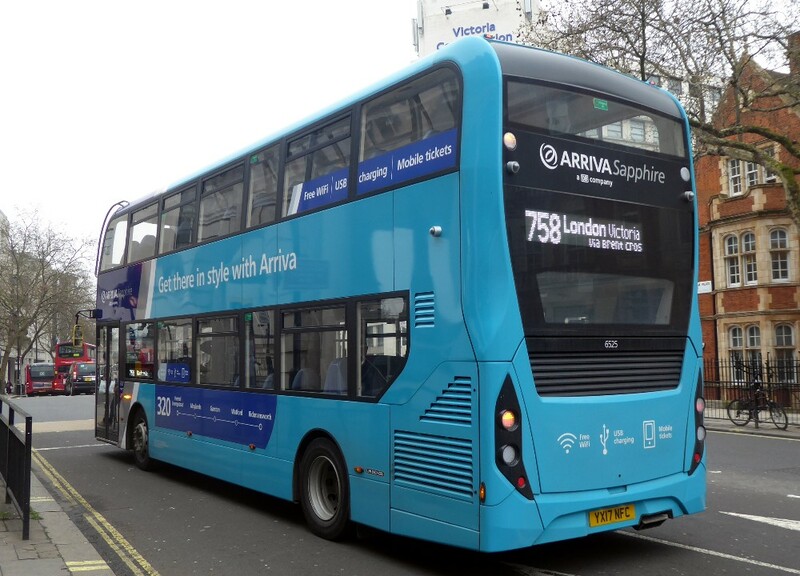 Gavin Francis has been busy in London recording the buses in use on the 702. 756 nsf - branded for route Royal Blue 33 - YX64VRR turns onto Elizabeth Bridge on April 13th by Gavin Francis. A surprise additional trial bus is 899 an Optare MetroDecker demonstrator YJ16DFG seen in Bulleid Way on April 12th by Gavin Francis. Another odd man out was this Claret branded Alexander Dennis Enviro 400 MMC 751 YX64VRL again in Bulleid Way on April 11th by Gavin Francis. Nick Cherry seems to have a few problems with his regular bus on the 275 and sent this picture from Friday 13th - unlucky for some!! 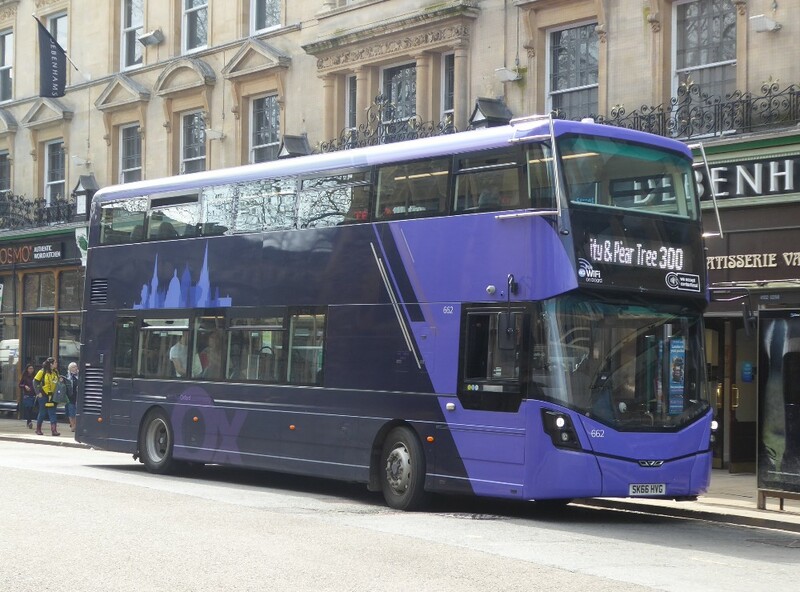 Seen in Speedwell Street, Oxford 50520 - Y358LCK fills in for the regular bus on April 13th by Nick Cherry. 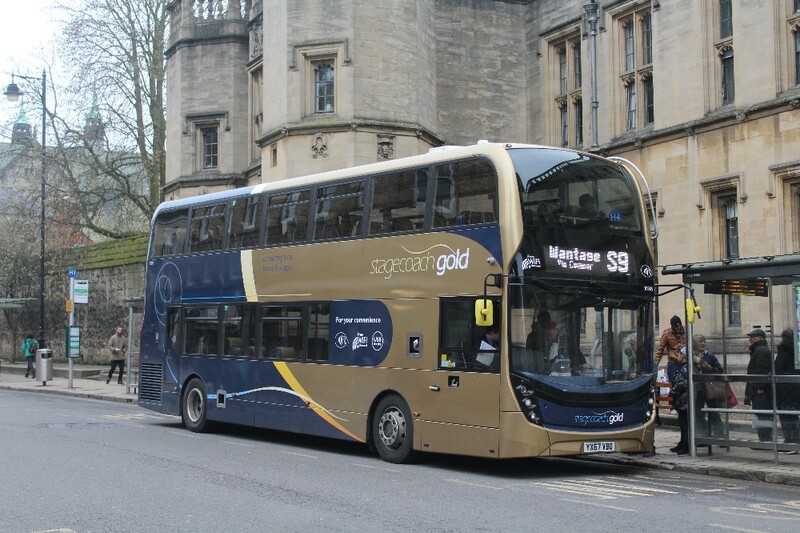 Alexander R. P. Edwards writes "I saw your picture of A Gold bus on the 10 on your latest news page and would like to point out that it's quite usual to see Gold buses on the 10 these days." 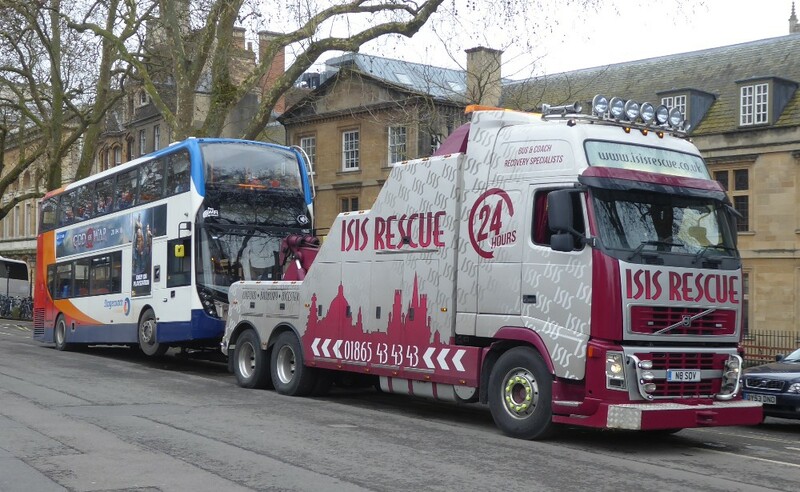 Friday 13th is no respecter of companies and above MMC 10683 is rescued by ISIS in New Road pictured by Gavin Francis. Several enthusiasts were waiting for 10905 to return from Bicester when working an S5 service on April 14th pictured by Gavin Francis. The girl in the front seems to replicate the colour scheme of the bus!!! 10905 earlier in the week working the S9 from St Aldates on April 11th by Graham Low. 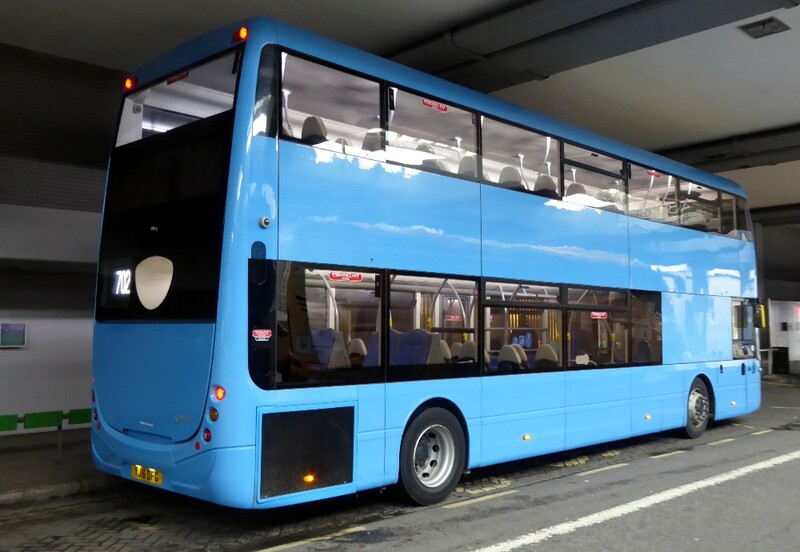 Returning to the matter of electric buses Gavin Francis reminded me that SC Oxford looked at a New Zealand built bus in 2004. His pictures are included below. These buses went on to work in Newcastle-upon-Tyne for a few years thereafter. Designline 80009 VX04MZG with trials in Gypsy Lane, Oxford on November 17tth 2004. Designline Olymbus New to: Stagecoach in Newcastle (Fleet nr: 80009) then later renumbered to 61001. It and its sisters worked on Quayside service in N-o-T.
Graham Low writes "These views of a new Stagecoach Swindon Scania show prominent branding for route 55 and a revised top to bottom sweep compared with the four that came to Oxford and now with C & G."
West's 15342 works the 55 in Swindon on March 22nd by Graham Low. Note the differences with 10905 above. 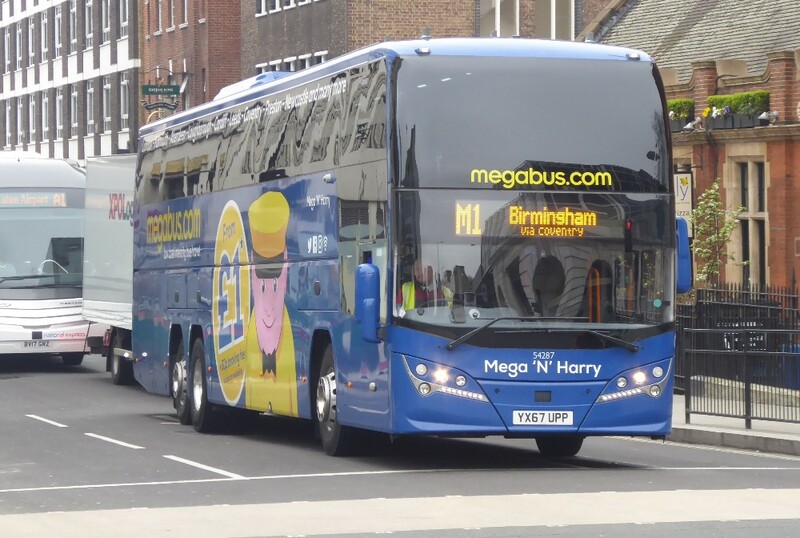 Gavin Francis sent a picture of a Megabus coach, most of which now provide route numbers on their destinations but sadly all seen are on the wrong side!! I see everyone seems intent in getting in on the Royal Wedding act!!! 54287 is working the M1 out of VCS on April 13th by Gavin Francis. In an earlier issue we mentioned that three ex Arriva London buses had been purchased for school work. We now have a picture that depicts the new livery. The bus is seemingly called Stuart. I believe they will go into service on Monday so could we have some pictures please? For further issues please refer to the menu on the left.